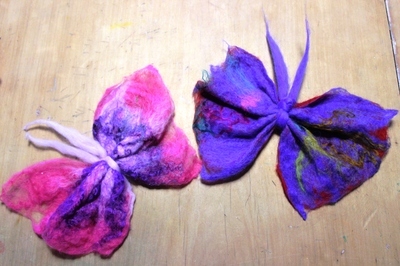 Once you've made your own unique piece of felt, it is very easy to turn it into a sweet butterfly. For this project, you will need to follow my "How to Make Felt" tutorial first, then come back here to turn the flat square (approximately 20cm x 20 cms) of felt into this adorable butterfly. Its wings are so soft and most children will be instantly attracted to these colorful creatures. 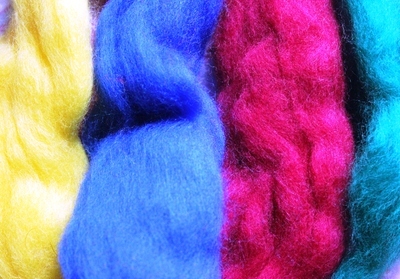 Roll the "roving" between your hands to make it into one long thin piece. 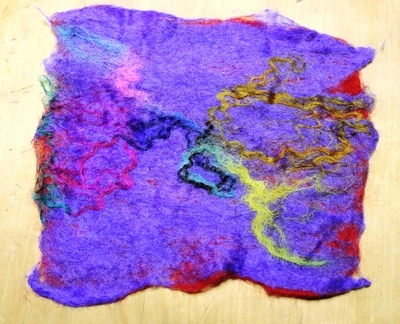 Take your hand made felt square and tie the long thin piece of roving around the middle, gently gathering it in to form the butterfly's body. Leave 2 long pieces hanging off the top to form the butterfly's antennae. You could attach the butterfly to some fishing twine which connects to a stick to make the butterfly dance around or maybe leave it to sit flat on a table. Why not make a whole butterfly family? These are just beautiful Lucy! My nieces would love these butterflies!